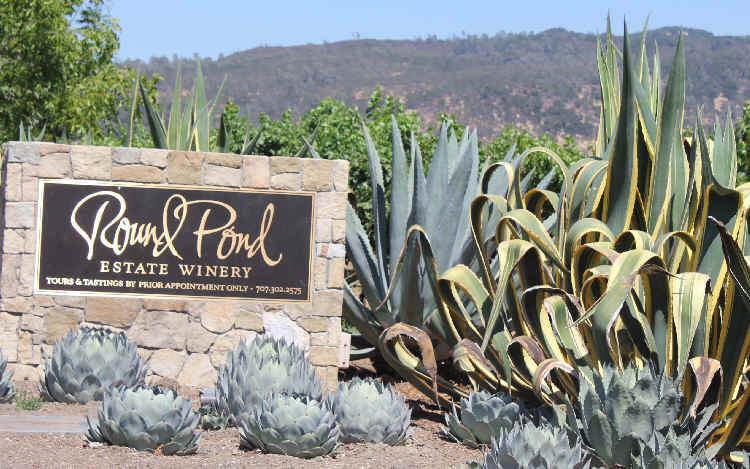 This vineyard easily merits inclusion on the list of California "Grand Cru" sites. The track record for Monte Bello is long and reasonably consistent. The vineyard is atop Monte Bello Ridge. Cabernet from this site is sometimes big and tannic, but almost always elegant and refined. 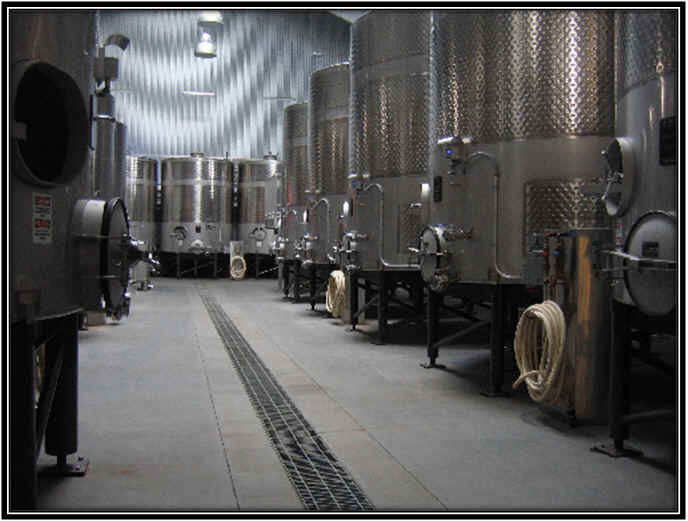 The winery was founded by Dave Bennion and some pals from Stanford Research Institute. They had several other partners and made wine in a cellar closed in the 1940s. The wines were like Dave: big, bold, intense and a bit rustic. 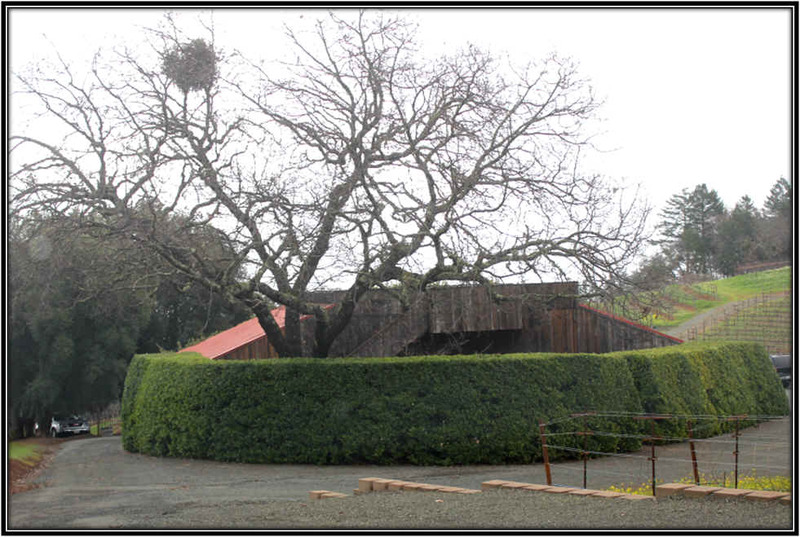 Winemaker Paul Draper arrived on the scene in 1970 and those wines of the early part of the decade were huge. They're still young and backwards. Draper made a sensational wine from a vineyard called Eisele in 1971 and this, too, is a candidate for the Hall of Fame. This wine really established the Eisele Vineyard as a potentially great site and Phelps made a few vintages of it in later years. The Ridge Santa Cruz Mountains appellation appears on Cabernets from time to time. 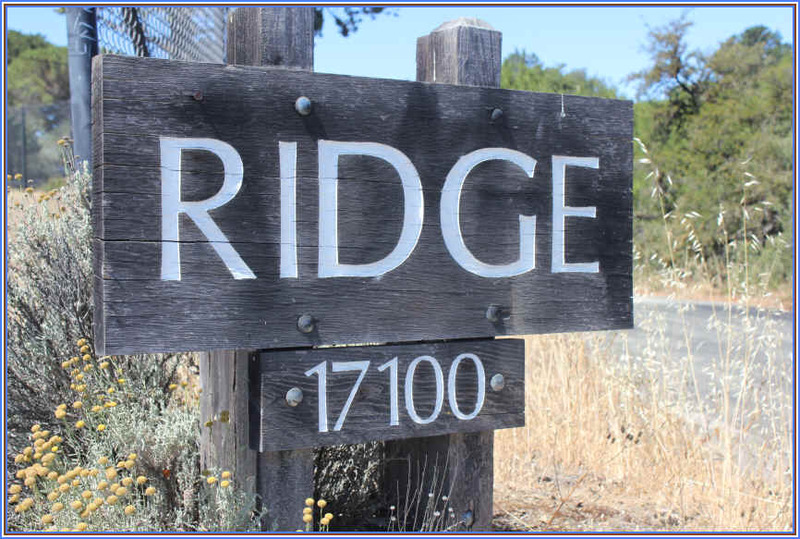 Ridge has segmented their Cabernet vineyards into three dozen different parcels. 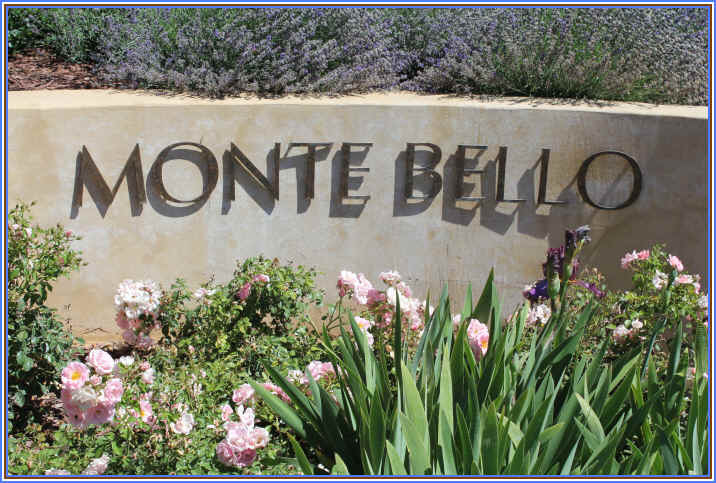 The best, most structured and cellar-worthy wines go into the Monte Bello, while the Santa Cruz label is the "declassified" wine. Their 2015 Santa Cruz Mountains blend of 81% Cabernet Sauvignon , 16% Merlot, 2% Petit Verdot and 1% Cabernet Franc. This is made of fruit from their Monte Bello vineyards. The wine is medium-full bodied and has a wonderful perfume of the Cabernets. Wood is in the background, enhancing the wine rather than covering it. This is drinkable now, especially with food. We expect it to develop and soften in the bottle over the next 5-10 years. Good value, too. 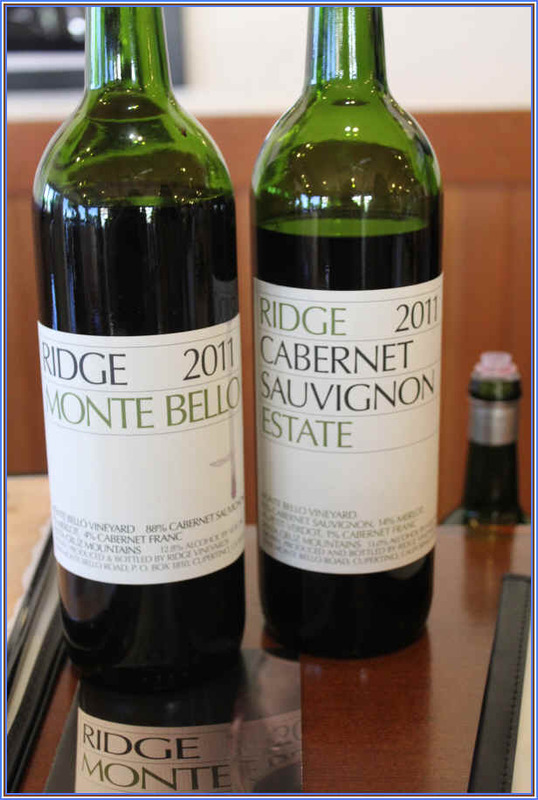 The Monte Bello "Cabernet" is routinely a wine we view as a leading ambassador for California wines. The wine has a great track record, being worthy of comparison to top Bordeaux. It's typically a much different animal from its Napa Valley competitors, as it's not a "fruit bomb" and we're fairly certain they don't blend in the grape concentrate called "Mega Purple" in hopes of gaining impressive numerical scores from those who critique California wines. These are some of California's best wines...as it's grown in notoriety, the wine has become a bit scarce. They used to sell it in a 12 bottle box. Then in a 6 bottle box. These days it's offered in distribution in a 3 bottle box. We periodically have a few bottles, but don't count on it. Rombauer is, these days, famous for its hugely-oaked Chardonnay (is it a Sp�tlese or merely a Kabinett level wine? ), but they make a nice, medium-full bodied Cabernet. They used to purchase fruit for this, and then for a while, it was solely from estate grown vineyards. Apparently sales have increased (as has the quality of the wine) and now they augment their own Cabernet vineyards with some grapes from growers. The 2014 has 11% Petit Verdot and 5% each of Merlot and Cabernet Franc. We used to view this as a pretty ordinary bottle of wine, but we must admit the quality level has been increasing, it seems, each vintage and we know our snobby wine-geek friends would be quite surprised if presented this wine "blind." They're using 70% brand new French oak, too, another enhancement. As a result, this is nicely cedary and can be put on the dinner table instead of, or along with, a number of other well-known Napa Cabernets. Old MacDonell had a farm, ee-eye-ee-eye-oh. And the farm is in Napa Valley's town of Rutherford, a prime site for Cabernet Sauvignon. The place is named after a childhood camping place in New York near West Point...Round Pond. 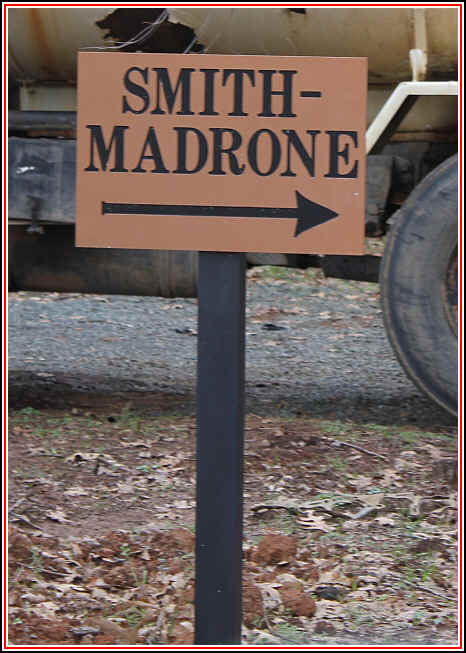 MacDonnell named his Rutherford retreat as Round Pond and today they grow grapes and olives on the property. It's a beautiful property, planted in fairly rich, fertile soil on the valley floor. We're fans of their Cabernet...and now they offer three bottlings. The 2015 Rutherford Estate is a deep, dark, full-bodied red. They fortify the Cabernet with a bit of Petit Verdot and the wine is very showy. We like the intense dark berry notes and the moderately oaky character. It's approachable now and it ought to cellar nicely for another 5-10 years. 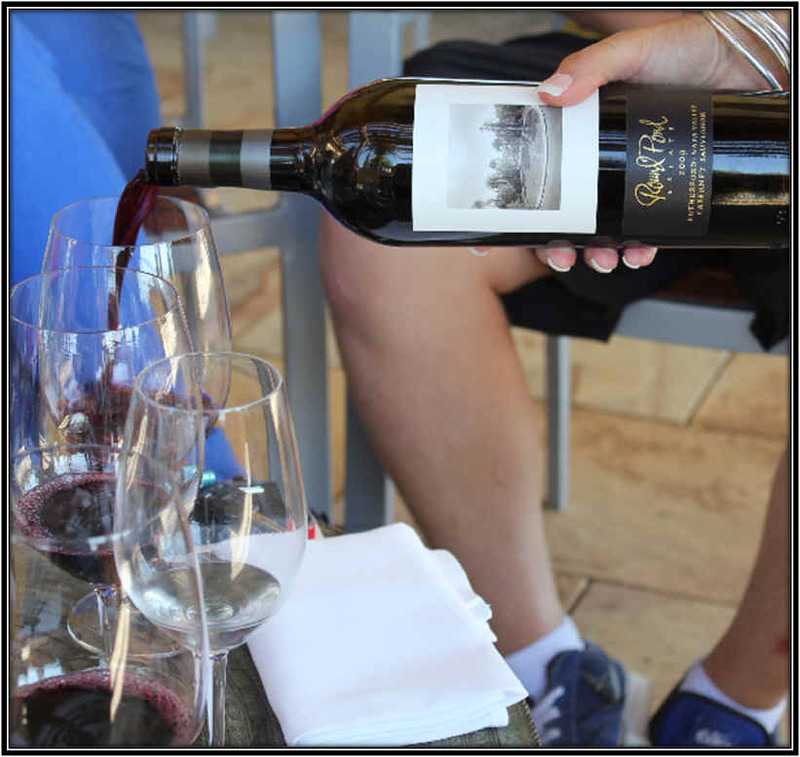 One of the best values in Napa Valley Cabernet was their "Napa" bottling. This is now labeled "Kith and Kin." Perfectly okay wine, but we've not carried it for a couple of vintages. We advised them to consider having a bit of oak showing in future vintages...the last one we tasted was well-made by a bit "standard." Stay tuned on that one. They sometimes have a "Reserve" bottling costing triple-digits. The last one we tasted was very fine...nicely oaked and showing dark fruits. The Sbragia name may be familiar to you if you read any wine publications. 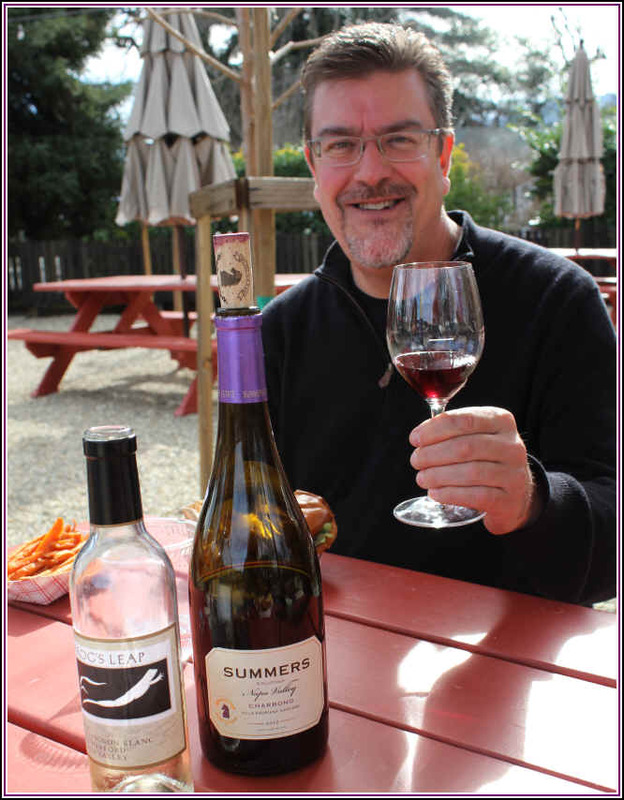 Winemaker Ed Sbragia has been with the Beringer winery for more than 25 years. They have put his name on a reserve wine or two. Sbragia's father cultivated plums in Sonoma County in the 1930s and later planted a vineyard. His efforts at winemaking were not so successful, apparently. But Ed came on board at Beringer in the 1970s, working with winemaking legend Myron Nightingale. Sbragia took over the helm in 1984 and this coincides with Beringer's making tremendous qualitative strides. The 1984 Reserve Cabernet really established Beringer as, finally, a source for major league quality wines. Well, Sbragia's son is now working in the wine business. 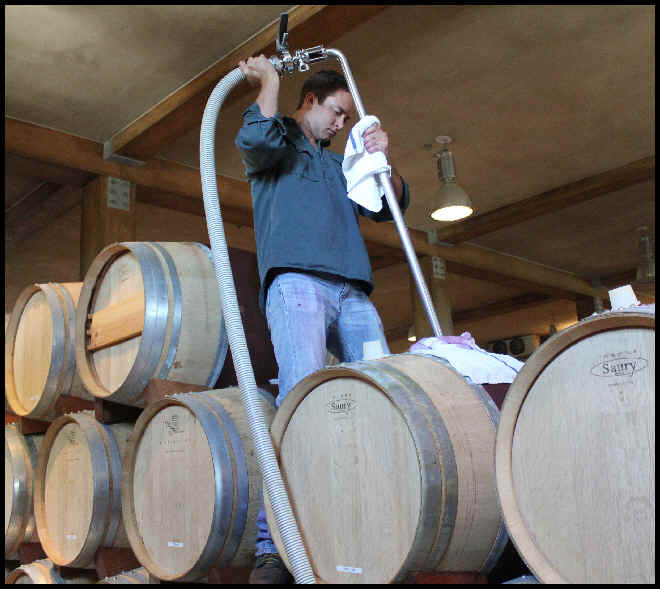 Adam Sbragia is employed at Beringer's "Souverain" facility in Sonoma. So now there's a "Sbragia Family" winery, featuring a range of wines. We included the "heavy hitter" bottling of Sbragia's line-up in our May 2005 blind-tasting of 2001 Napa Cabernets. The wine was the group's favorite wine. I also had it ranked first. In October of 2006 we had Sbragia's 2003 "Monte Rosso Vineyard" wine in a blind-tasting of Cabernets. It was the group's top wine as it showed sweet oak and a wonderful fruit fragrance and flavor. I knocked it a bit for its "currently fashionable styling," but there's no denying the wine is quite good. The nose shows sweet fragrances and the wine is full and deep on the palate. It will probably cellar well for 5-10+ years, but it's most showy now. The Monte Rosso vineyard was, of course, owned by Louis Martini and it's now part of the Gallo empire. The soils are decomposed volcanic red rock, a wonderful environment for Cabernet Sauvignon. The 2010 was very good, but we've not found the 2011 or 2012 to be especially showy or of similar quality and complexity. Brother Justin Meyer started his wine career, I believe, at the Christian Brother's facility. 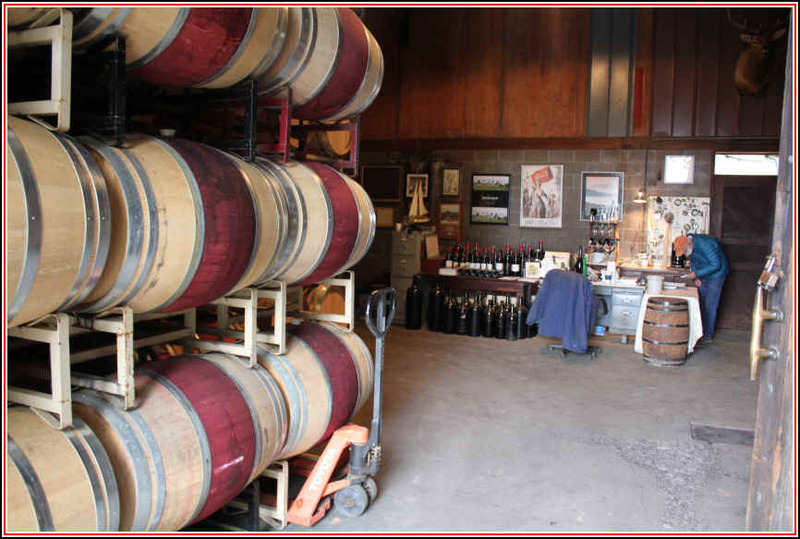 He was involved at Franciscan Vineyards in the early days of that property before striking gold with Silver Oak. The recipe has been simple, the winery creating a Cabernet styled along the lines of the old-time Beaulieu Vineyards Cabernets: lots of American oak and no Merlot. We've liked these for a long time, but it took Robert Parker (The Wine Advocate) until the early 1980s to finally praise these wines. Having been beatified, the wines had been more difficult to acquire. No longer the new kid on the block, Silver Oak wines are routinely viewed derisively by hot-shot sommeliers who have dubbed the wine "Silver Joke." 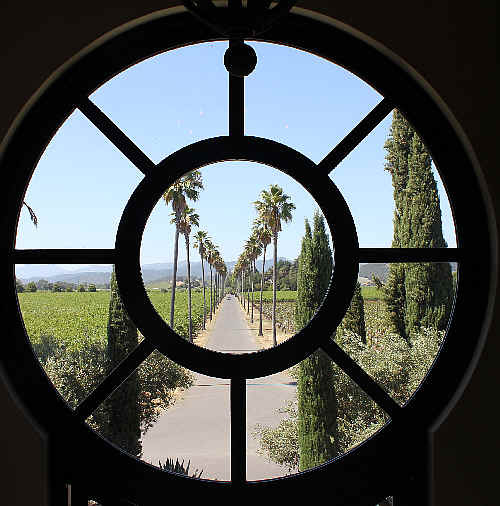 We know a number of wine biz people who look down their pointy little noses at Silver Oak's wines. Okay...the wine might not be the most complex Cabernet on the planet, but it is still a rather nice wine with a steak. We opened a 1997 Alexander Valley in July of 2012 and this was a beautiful bottle of wine! Anyone deriding this is simply an arrogant snob. I'll bet the same folks would gush about similarly-styled wines from Spain's Rioja. 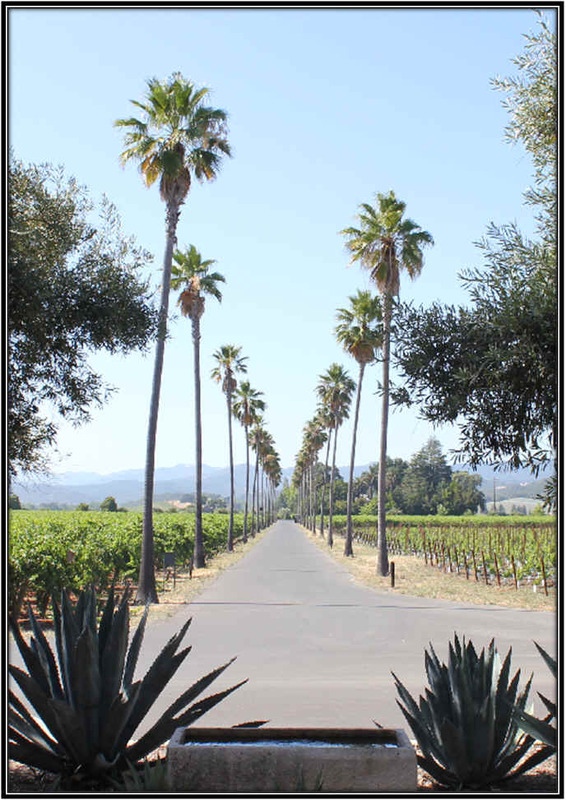 A Napa bottling is produced at the Napa facility and, having bought the old Lyeth winery in Sonoma, their Alexander Valley wine is vinified in Geyserville. 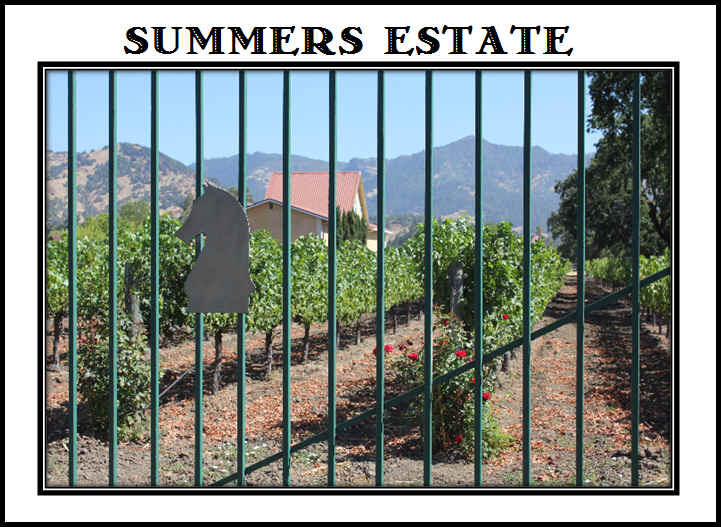 The single vineyard "Bonny's" is no longer in production at Silver Oak, but the Meyer family still owns the vineyard and they are offering "Bonny's Vineyard" Cabernet under their own banner. If you like this style of wine, which we do, please have a look at some of my Spanish selections---these are matured in American oak as well, and many offer as much pleasure as do the Silver Oak wines. The wines hold up beautifully, but we've found they are fully developed upon release. While they may soften with time, you won't find subtle nuances in an aged Silver Oak bottle...what you see is what you get. Delicious with grilled or roasted red meats. The 2014 Alexander Valley was the latest release. 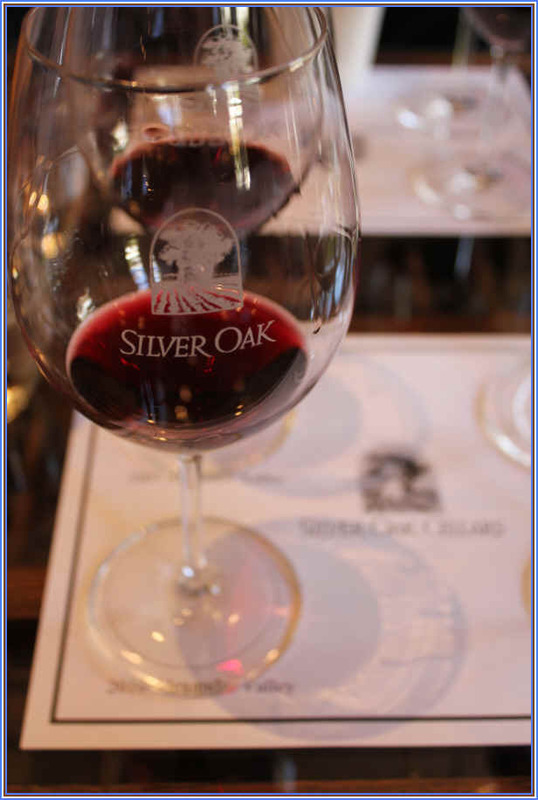 It is a wonderful, classic example of Silver Oak Cabernets...lots of woodsy fragrances on the nose and palate. The tannins are approachable and the wine can easily be consumed now, in its youth. It ought to last well for another 10-15 years if stored properly. This is particularly satisfying when paired with a grilled steak. 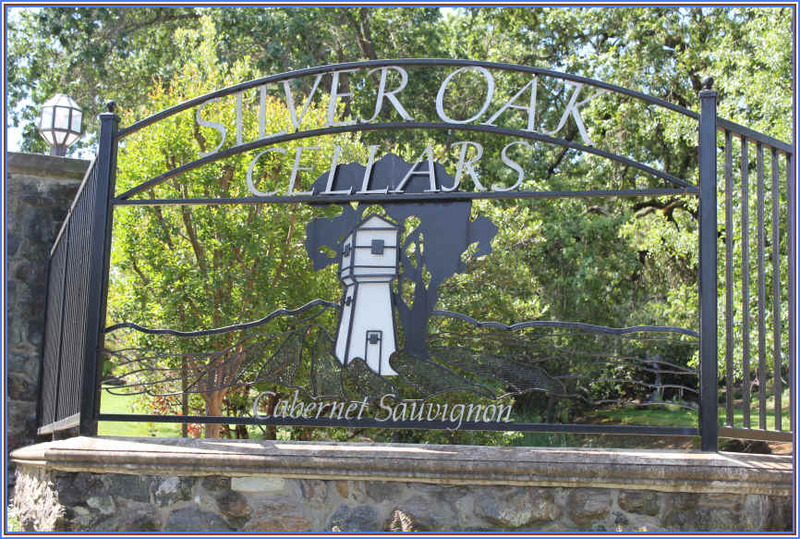 The Napa Cabernet is a fine example of what Silver Oak Cabernet is all about. It's a throw-back to the great old bottles of Private Reserve Cabernet from Beaulieu Vineyard back in the 1960s and 1970s. Those were wines which showed lots of dark fruit notes and plenty of American oak. We currently have the 2013 Napa...quite good. 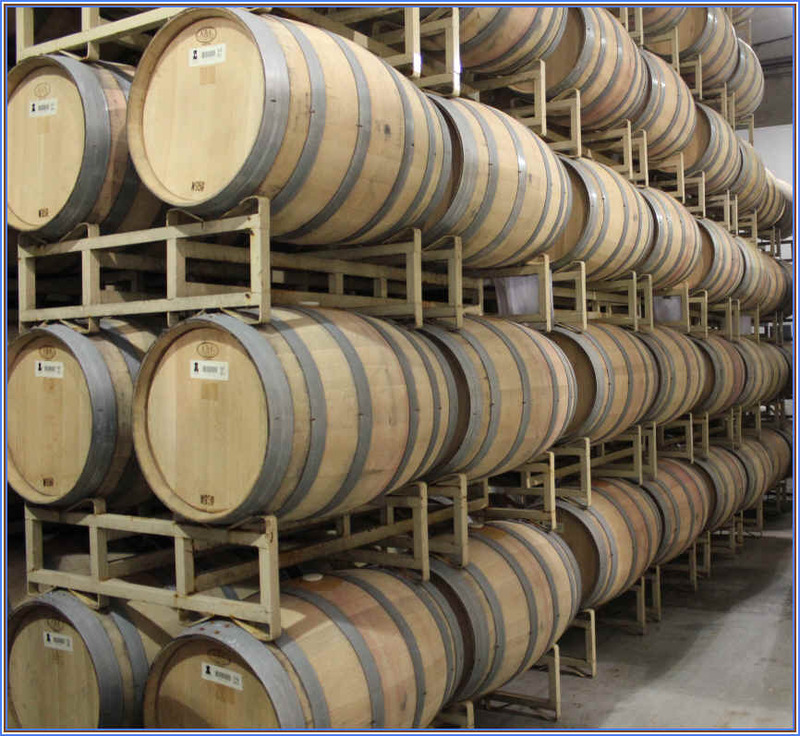 Silver Oak now owns a barrel-building company in Higbee, Missouri. They had purchased a 50% stake in the company back in the year 2000, but these days they own the place outright. 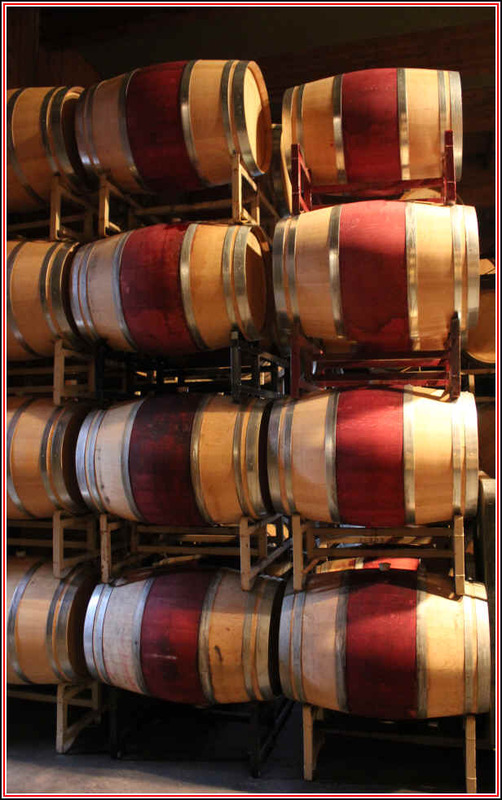 It allows them to control and maintain the quality of the barrels that are so important to the style of Silver Oak's wines. As you can see, the price of a bottle of wine has changed slightly. We checked the Bureau of Labor Statistics "Inflation Calculator." That allows you to select a year and dollar figure and calculate how much that money is worth today. 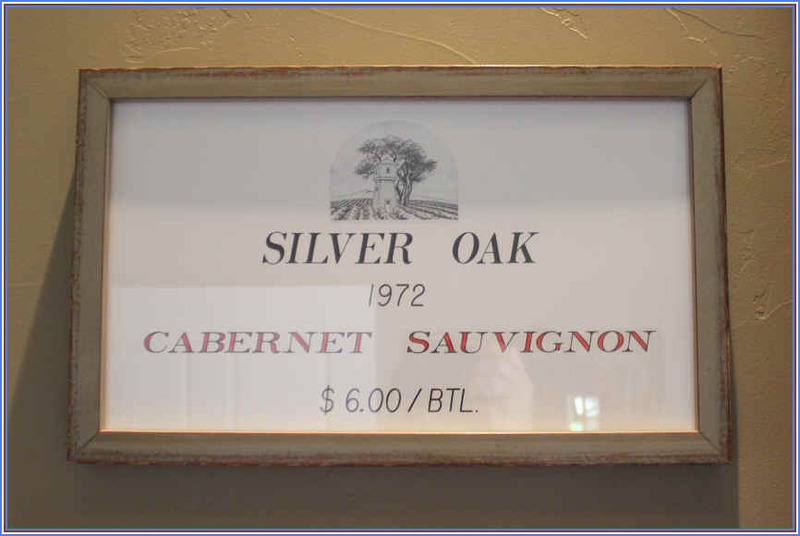 The $6 bottle of Silver Oak Cabernet would have been sold, likely, in 1976. That $6 calculates to $26.59 in 2018. As you can see, the inflation rate for the wine industry is far different. The cost of vineyard land, barrels, labor, etc. are far different today than in the 1970s! There was a wine shop in San Francisco some years ago that had a marvelous little catalogue and they worked with a local cartoonist to have great art work on the covers, always barbing some aspect of the wine industry. There are always people who will tell you they used to buy "such and such a wine and it was only ten bucks back in the day." Yes...you were once in diapers and now look at you. 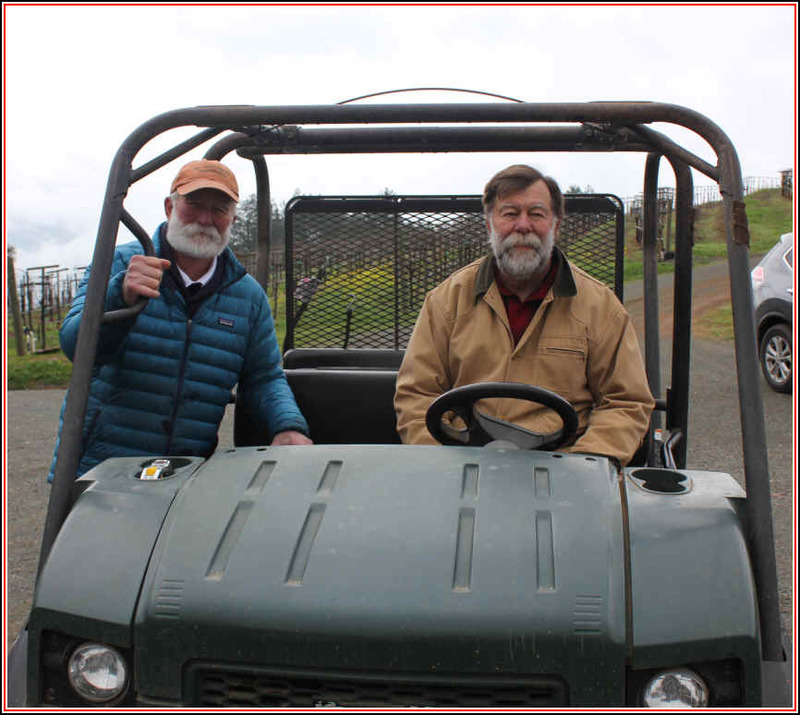 The Smith Brothers launched their winemaking adventure in 1971 when Stu Smith began planting vines on their 200 acre ranch atop Spring Mountain in Napa. He had explored the site the year before and, aside from lots of forest land, he found evidence that vineyards had been planted there ages ago as there were still some grape stakes hither and yon. The property, in fact, had been turned over to George W. Cook in 1885 when President Chester Arthur granted title for the estate. The Smiths have the deed from the US Land Office and they wrap bottles of a reserve wine they call "Cook's Flat." Back in the early 1970s there were not too many wineries on Spring Mountain, but these days they have all sorts of winemaking neighbors. There are about two dozen wineries on that winding road. They are not far from Philip Togni, Paloma, Ritchie Creek and Barnett. Stu's brother Charles is the winemaker, helped by Stu's son Sam Smith. They've been making good wines up there for decades and they are well-regarded by Napa Valley winemakers, but they're a bit unknown to many wine consumers. The Smiths put more effort into making good wine than they do in tooting their own horn. Cabernet Sauvignon is planted on south and west-facing slopes. They also make Chardonnay and Riesling. At one time they produced a bit of Pinot Noir. The 2014 Cabernet is currently in the shop. The winter of 2013/2014 was rather dry and the Smiths say this led to the Cabernet grapes being a bit smaller than normal, resulting in greater fruit intensity. The Smiths, by the way, eschew irrigation and prefer dry-farming for all their vineyards. They look to make traditionally-styled Cabernet and are not looking for the darkest, inkiest, most powerful wine in the world. The alcohol level of the 2014 is just less than 14%, a rarity these days in California. It's blended with 8% Cabernet Franc and 7% Merlot. 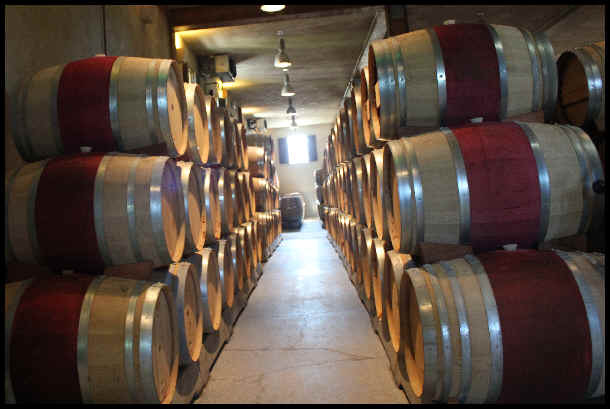 The wine is matured in French oak for a year and a half, with 70% of the barrels being brand new. Despite such a high level of new wood, you won't find the wine to be particularly oaky, a testament to the intensity of the Cabernet Sauvignon from their mountain top site. The wine is delicious now and yet it likely has good cellaring potential if you can resist the temptation to open a bottle tonight. 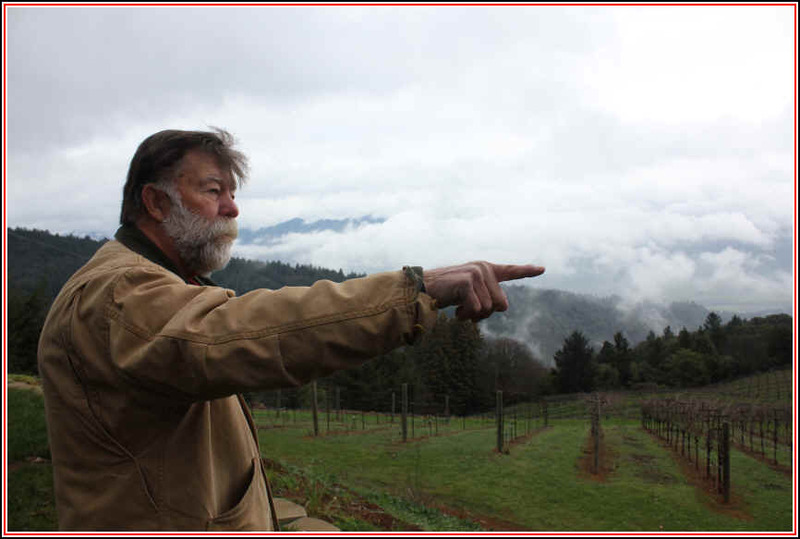 Stu Smith explaining the orientation of their vineyards atop Spring Mountain. Those trees in the middle of this snapshot are Picholine Olives. They don't make any oil, but have offered to give, gratis, the olives to someone who would harvest them and return with a few bottles of oil. The Summers family has been growing grapes and making wine for a few years now, having traded in his banking career for one in winemaking. Jim was bemused by the Napa Valley wine culture. He passed away in August of 2018. For many years he visited our shop and we enjoyed hearing his observations about the wine business. Summers was a real salt-of-the-earth kind of guy, a far cry from the business school winery executives that had moved into the community. He was also amused by the rich celebrities who have flocked to the Napa Valley looking for the ego gratification one gets seeing one's name on the label of bottles of wine they're hoping to sell for a couple of hundred bucks a copy. They're on Tubbs Lane in Calistoga, a neighborhood anchored by a little winery called Chateau Montelena. We visited the winery one day with Luciano Sandrone, a famous Barolo winemaker. Sandrone's grand-daughter Alessia was staying with a Silicon Valley family for a couple of weeks and then Luciano, his wife Mariuccia and grandson Stefano came to visit for a little vacation. Summers knew we were mainly in the neighborhood to visit Montelena as they are marketed by the same company that imports the Sandrone wines. Illustrating what a sweet guy he was he knew we had to depart for our appointment at the neighboring winery. It was a warm day and he said "Kids, it's a nice day and I don't think you want to visit another boring, old wine cellar. Tell you what, your Uncle Gerald and Grandpa can go see Montelena while you and your Grandma can come with me. Bring your swimming suits and you can go for a swim in the pool. 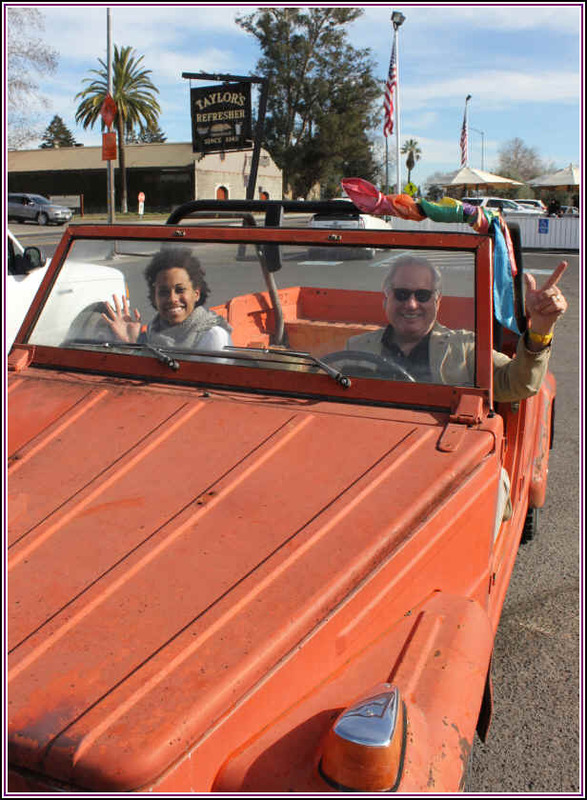 I'll drive you to Montelena where you'll have lunch." 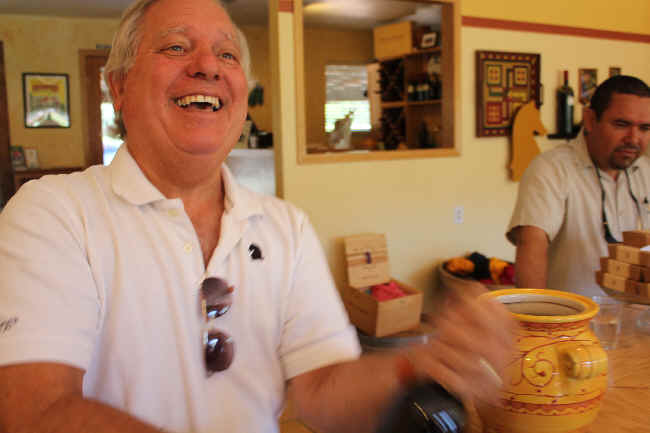 Jim Summers was thrilled to have a visitor as world famous as Signor Sandrone to come see his winery and taste his wines. We have featured Summers wines in the shop for many years...the Cabernet is a popular wine with our customers, but we especially like the Summers Charbono (it's on the picnic table in a few photos below). A 2015 "Andriana's Cuv�e" is one of the few bargains in good California Cabernet. This is a blend of Napa (33%) and Sonoma (67%) fruit. It's a medium-bodied Cabernet, intended for immediate drinking, rather than extended cellaring. It's a wine which is quite drinkable in its youth...very fine. Made predominantly of Cabernet Sauvignon (there's a bit of Merlot, Petit Verdot, Syrah and Petite Sirah in the mix) and matured for 16 months in French oak, half the barrels being brand new. 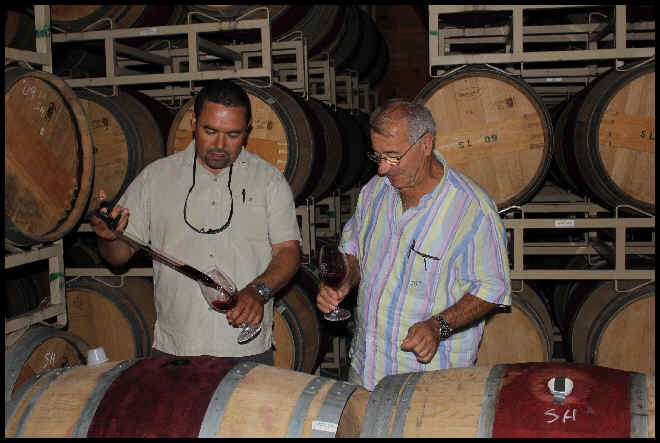 Famous Barolo winemaker Luciano Sandrone and Famed Calistoga Vintner, Jim Summers. Jim Summers and that's winemaker Ignacio Blancas, who despite his name, makes some terrific red wines. 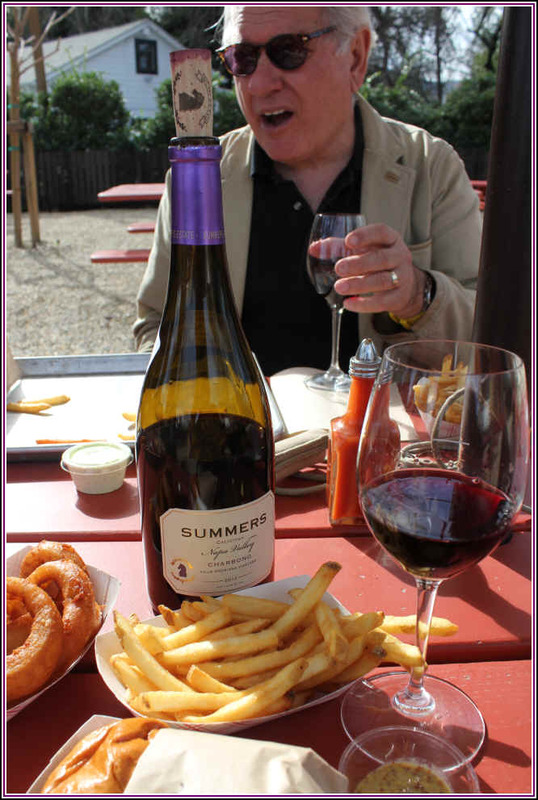 Jim Summers enjoying a glass of his Charbono one cool day when we met him at Gott's Roadside burger stand in St. Helena. We brought stemware and had a cool bottle of his fabulous Charbono in our cellar bag (much to his surprise and delight). Joining us that day was Marianna Pojer of Italy's famous Pojer e Sandri winery in the Trentino region. Our friend John Downing had come up to attend a Gambero Rosso tasting in San Francisco and he joined us on our little tour. John works for the Hollywood store of K&L. Jim didn't drive a fancy car as you can see.